Much resistance to change can be avoided if effective change management is applied on the project from the very beginning. While resistance is the normal human reaction in times of change, good change management can mitigate much of this resistance. Change management is not just a tool for managing resistance when it occurs; it is most effective as a tool for activating and engaging employees in a change. Capturing and leveraging the passion and positive emotion surrounding a change can many times prevent resistance from occurring—this is the power of utilizing structured change management from the initiation of a project. Participants in Prosci’s 2013 benchmarking study commented on the fraction of resistance they experienced from employees and managers that they felt could have been avoided with effective change management (see below). Participants cited that much of the resistance they encountered could have been avoided if they applied solid change management practices and principles. The moral here is: if you do change management right the first time, you can prevent much of the resistance from ever occurring. Each of these tactics, all of which are part of a structured change management approach, directly address some of the main sources of resistance and can actually prevent resistance from happening if they happen early in the project lifecycle. Frontline employees will understand the "why" behind the change and see the commitment from leaders throughout the organization. In many cases, this will prevent resistance from occurring later in the project when it can adversely impact benefit realization, project schedules and budget. Do not be surprised by resistance! Even if the solution a project presents is a wonderful improvement to a problem that has been plaguing employees, there will still be resistance to change. Comfort with the status quo is extraordinarily powerful. Fear of moving into an unknown future state creates anxiety and stress, even if the current state is painful. Project teams and change management teams should work to address resistance and mitigate it, but they should never be surprised by it. Research on the function of the brain shows that resistance is not only a psychological reaction to change but actually a physiological reaction (see the "The Neuroscience of Leadership" by David Rock and Jeffrey Schwartz for more information). To act in a new way requires more power from the brain. The physiological reaction when presented with a new way of doing something is to revert back to what the brain already knows. Human beings can adapt their behavior, but it is a difficult and painful process—even for the brain itself. These groups are likely sources of resistance and should be addressed proactively in the project lifecycle with targeted tactics for mitigating these objections. Managing resistance to change should not be solely a reactive tactic for change management practitioners. There are many proactive steps that can be used to address and mitigate resistance that should be part of the change management approach on a project. During the creation of the change management strategy, generate anticipated points of resistance and special tactics to manage them based on readiness assessments. The resistance management plan is one of the five change management plans you create in this phase, along with the communication plan, sponsorship roadmap, coaching plan and training plan. These change management plans all focus on moving individuals through their own change process and addressing the likely barriers for making the change successful. The resistance management plan provides specific action steps for understanding and addressing resistance. In the final phase of the process, you collect feedback to understand employee adoption and compliance with the new workflows and processes prescribed by the change. Evaluating this feedback allows you to identify gaps and manage the resistance that may still be occurring. This phase also includes the top ten steps for dealing with resistance to change, which can be a powerful tool for managers and supervisors in the organization. Formally addressing resistance ensures that it is understood and dealt with throughout the lifecycle of the project. It moves managing resistance to change from simply a reactive mechanism to a proactive and ultimately more effective tool for mobilizing support and addressing objections. Managing resistance is ineffective when it simply focuses on the symptoms. The symptoms of resistance are observable and often overt, such as complaining, not attending key meetings, not providing requested information or resources, or simply not adopting a change to process or behavior. While they are more evident, focusing on these symptoms will not yield results. To be effective at managing resistance, you must look deeper into what is ultimately causing the resistance. Effective resistance management requires identification of the root causes of resistance—understanding why someone is resistant, not simply how that resistance is manifesting itself. With the knowledge of these primary root causes, change management teams can adequately prepare a compelling case for the need for change that is communicated by senior leaders in the organization. This simple activity targets the top cause for resistance (lack of awareness) and can ultimately prevent much of the resistance a project experiences. You can use additional benchmarking findings and your own experience with change in your organization to craft a list of likely root causes with activities to address and mitigate each one. The Prosci ADKAR® Model and an ADKAR assessment also enables you to home in on the root cause of resistance by identifying an employee’s barrier point and addressing that root cause. ADKAR is a powerful diagnostic tool that can be quickly and easily applied by change management teams, managers and frontline supervisors in formal assessments or in casual conversations. A final note on resistance to change: resistance is ultimately an individual phenomenon. While research and analysis can identify broadly the root causes for resistance, it is important to ultimately address resistance by individuals at the individual level. The best way to identify the root cause of resistance is through a personal conversation between a resistant employee and their supervisor, which leads us to the final tip for managing resistance. At a high level, senior leaders can help mitigate resistance by making a compelling case for the need for change and by demonstrating their commitment to a change. Employees look to and listen to senior leaders when they are deciding if a change is important, and they will judge what they hear and what they see from this group. If senior leaders are not committed to a change or waver in their support, employees will judge the change as unimportant and resist the change. Managers and supervisors are the other key group in terms of managing resistance. They are the closest to the frontline employees who ultimately adopt a change. If they are neutral to or resistant to a change, chances are that their employees will follow suit. However, if they are openly supportive of and advocating for a particular change, these behaviors will also show up in how employees react to the change. Benchmarking data shows five key roles of managers and supervisors in times of change, and two of these roles are directly connected to managing resistance to change: demonstrating support for the change and identifying and managing resistance (read more about the five roles of managers and supervisors). Remember, though, you must address resistance from managers first before asking them to manage resistance. 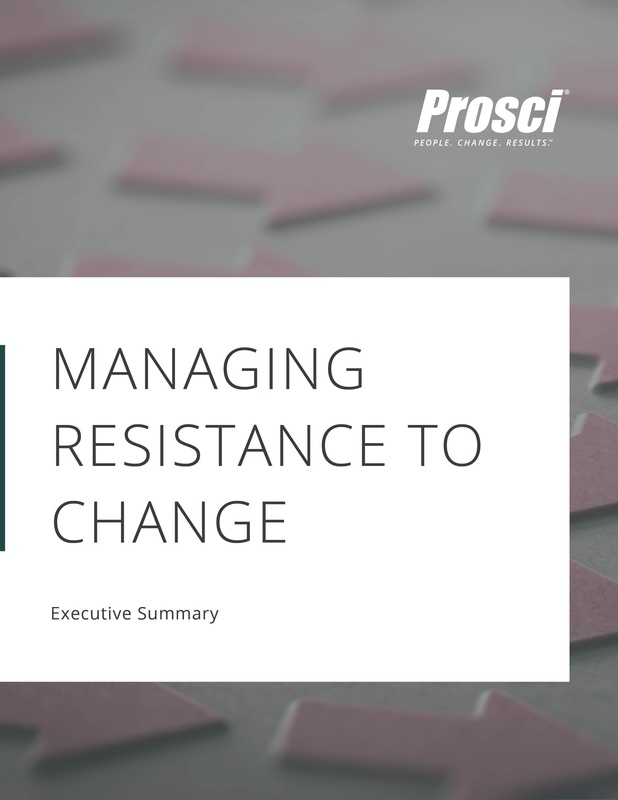 The change management team or resource can do much of the leg work in understanding and addressing resistance, but the face of resistance management to the organization is ultimately senior leaders, managers and supervisors. The change management resource can help to enable the "right" resistance managers by providing data about where resistance is coming from, likely root causes of resistance, potential tactics for addressing resistance and tools to identify and manage resistance, but the "right" resistance managers must take action to address objections and move employees forward in the change process.